Cerdeño, E., and M. Bond. 1998. 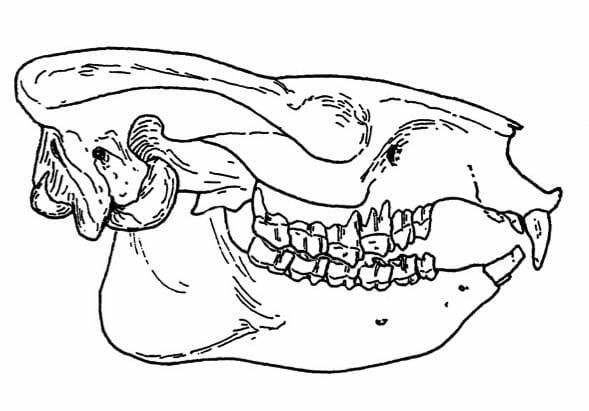 Taxonomic revision and phylogeny of Paedotherium and Tremacyllus (Pachyrukhinae, Hegetotheriidae, Notoungulata) from the late Miocene to Pleistocene of Argentina. Journal of Vertebrate Paleontology 18:799-811. Croft, D.A., and F. Anaya. 2006. A new middle Miocene hegetotheriid (Notoungulata: Typotheria) and a phylogeny of the Hegetotheriidae. Journal of Vertebrate Paleontology 26:387-399. Kramarz, A.G., and E.R. Paz. 2013. Un Hegetotheriidae (Mammalia, Notoungulata) basal del Mioceno temprano de Patagonia. Revista Mexicana de Ciencias Geológicas 30:186-195. Reguero, M.A., and E. Cerdeño. 2005. New late Oligocene Hegetotheriidae (Mammalia, Notoungulata) from Salla, Bolivia. Journal of Vertebrate Paleontology 25:674-684. Reguero, M.A., M.T. Dozo, and E. Cerdeño. 2007. A poorly known rodentlike mammal (Pachyrukhinae, Hegetotheriidae, Notoungulata) from the Deseadan (late Oligocene) of Argentina. Paleoecology, biogeography, and radiation of the rodentlike ungulates in South America. Journal of Paleontology 81:1301-1307. Seckel, L., and C. Janis. 2008. Convergences in scapula morphology among small cursorial mammals: an osteological correlate for locomotory specialization. Journal of Mammalian Evolution 15:261-279.